April 2015 - HGR Inc.
A team Euclid High School students, under the direction of Bob Torrelli, began preparing for the AWT RoboBots competition months ago, and their work paid off with two wins at the battle robots tournament held Saturday, April 25 at Lakeland Community College. Check out videos of The Untouchables. Sponsored by HGR Industrial Surplus and SC Industries, The Untouchables claimed an opening round win over The Gang for Good. In the next round, The Untouchables claimed a decision over The Vikinators. Next up was a meeting with Dreadnaught, the team that would eventually claim the tournament championship. The Untouchables fell short in that match, and slipped into the consolation bracket to take on Polaris. Again, The Untouchables came up short against on of the tournament’s top teams, ending their run with a 2-2 record and tied for ninth place in the tournament. The sparks will fly when area high school students square off in the 2015 RoboBots Competition Saturday, April 25 at Lakeland Community College. Team Euclid, made up of Euclid High School students and sponsored by HGR Industrial Surplus, is one of the teams preparing to put its 15-pound remote control battle robot into the arena. 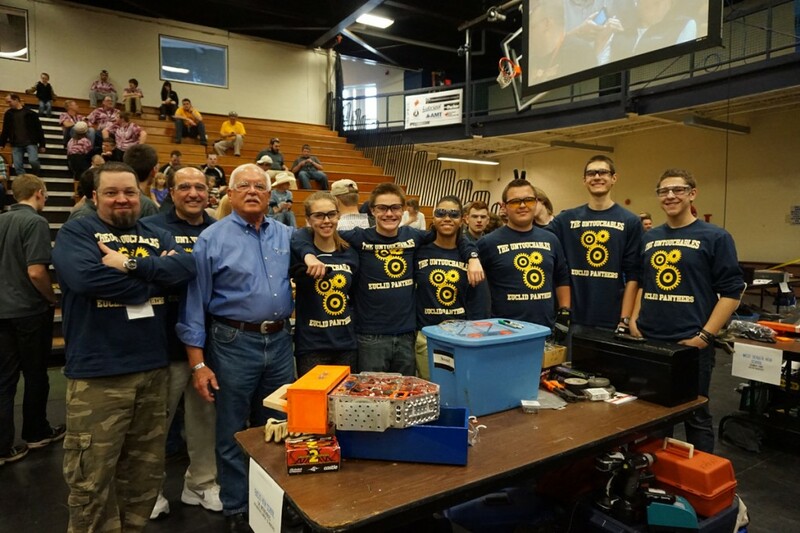 RoboBots is a program of the Alliance for Working Together, a Cleveland area group of companies focused on advancing manufacturing through training and education, outreach and strategic partnerships and grants. RoboBots teams began preparing their battle bots back in December. Team Euclid visited HGR and picked up a few items to add to their battle bot. 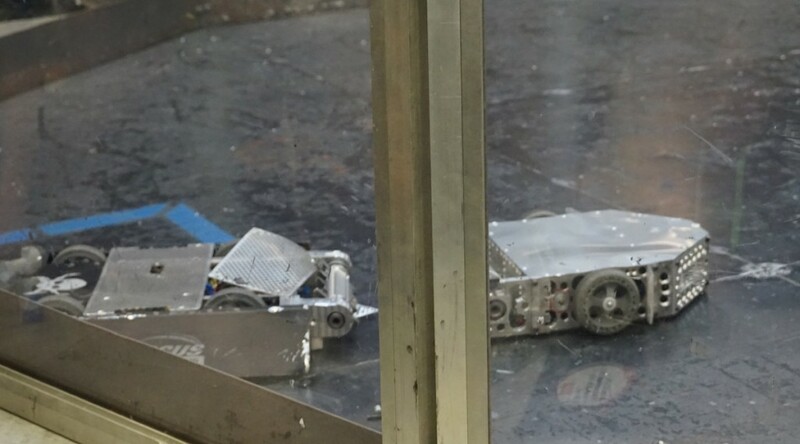 Over the past few months, students have been able to enjoy hands-on experience in manufacturing, working alongside engineers and machinists to create a winning battle robot. For more information on RoboBots, take a look at the video from the 2014 competition. HGR’s Slam Dunk Savings Customer Appreciation event, held Thursday, March 26, had more than its normal share of winners. 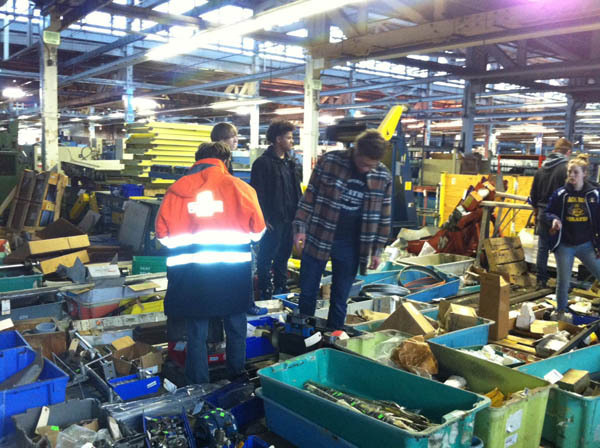 Yes, customers showed up and got great deals on discounted industrial equipment and used manufacturing machinery. But some customers got even more than great deals. Rich Clevesy was the big winner, claiming the grand prize drawing for a Marriott Getaway Weekend package. Robert Fenn of Inovent Engineering, Bob Horning and John Glauner also had their names drawn for Visa gift cards at this special sale event. Keep an eye out for the next Customer Appreciation special so that you can also cash in on great deals and exciting prizes.